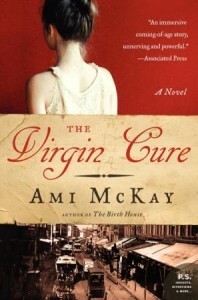 Set on the streets of Lower Manhattan in 1872, The Virgin Cure is the story of Moth, a girl abandoned by her father and raised by a mother telling fortunes to the city's desperate women. One summer night, twelve-year-old Moth is pulled from her bed and sold as a servant to a finely dressed woman. It is this betrayal suffered at the hands of her own mother that changes her life forever. Knowing that her mother is so close while she is locked away in servitude, Moth bides her time until she can escape, only to find her old home deserted and her mother gone without a trace. Moth must struggle to survive alone in the murky world of the Bowery, a wild and lawless enclave filled with thieves, beggars, sideshow freaks, and prostitutes. She eventually meets Miss Everett, the proprietress of an "Infant School," a brother that caters to gentlemen who pay dearly for "willing and clean" companions--desirable young virgins like Moth. Moth also find friendship with Dr. Sadie, a female physician struggling against the powerful forces of injustice, who teaches Moth to question and observe the world around her. The doctor hopes to protect Moth from falling prey to a terrible myth known as the "virgin cure"--the tragic belief that deflowering a "fresh maid" can cleanse the blood and heal men afflicted with syphilis--that has destroyed the lives of other Bowery girls. If I had to choose one word to describe The Virgin Cure, it would be Dickensian. McKay has created a tough and determined heroine in Moth and surrounded her with the sort of folk teeter on the line of being cartoonish, but never quite cross into that territory. I found the world of post-Civil War New York that McKay creates to be fascinating and more than a little frightening. Moth makes decisions that, with a modern mind, we would question. However, when you see the world from which she comes, you begin to wonder if you would have done anything different. I enjoyed McKay's writing style and the plot of the book held me until the last page. That being said, the book did have patches of unevenness and I wasn't always sure what direction the author was trying to take. Also, while most of the characters are fascinating, there were a few that were just plain unbelievable (mainly, Mrs. Wentworth). I think that if those characters had been worked through a bit more, it would have smoothed the story out a bit more. Still, I greatly enjoyed The Virgin Cure and would recommend it to someone looking for a historical novel set in this era. This post is part of a blog tour by TLC Book Tours. I received a book to read and review, but all opinions are mine and mine alone. I received no other compensation for this review. This is one of those books I've been meaning to get to ever since I first heard about it. Thanks for the reminder! I hadn't heard of this one, but I do love historical fiction. Thanks! this story sounds like a good read! I'm a huge Dickens fan so the fact that you call this book Dickensian is a huge draw for me!